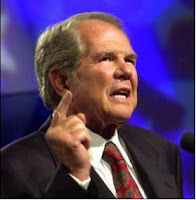 By now, 700 Club televangelist Pat Robertson's comments on the disaster in Haiti are shockingly familiar. If you haven't heard them, click on the link below. Such remarks by Robertson are at their best thoughtless and cruel. At worst, they are blasphemous and heretical. What kind of God is implied here, one that would bring down cursing on an island already beset by such great suffering? What kind of God would afflict poor Haitians and leave such other cesspools of immorality in the world untouched? It's so tempting to assign blame or to try and explain the cause of such disasters. All of us, in a sense, are tempted to do such things. We want to manage and contain the world's suffering, control it, compartmentalize it away so that it cannot spread to us and our loved ones. However, in doing so, we too often trivialize the problems, heap further suffering on the afflicted, and harden our hearts. Not to mention invite the ridicule of others. I so much prefer the way of Jesus, who had something quite different to say in response to affliction. In John's Gospel, Chapter 9, Jesus happens upon a man who is blind from birth. His disciples ask, "Who sinned, this man or his parents, that he was born blind?" In other words, "Who's to blame, Jesus? Whose sin is the direct cause of his suffering?" Sound familiar? Jesus surprises them (and us) with his response: "Neither this man nor his parents sinned; he was born blind so that God's works might be revealed in him." Jesus then heals the man's eyes and restores his sight. The man's suffering becomes the occasion for God's kingdom to bring healing and relief. We can't assign responsibility for the earthquake; but what we can do is use this tragedy as an occasion for God's works to be revealed in ministries of compassion and generosity. Please pray, give, and seek ways for God to be glorified amidst such devastation. 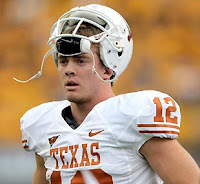 Colt McCoy Gets His Say! In today's Dallas Morning News, sportswriter Keven Sherrington described Texas' heart-breaking loss to Alabama last night by highlighting the apparent silencing of UT quarterback Colt McCoy, after his early first quarter injury: "The winningest quarterback in college football history, left without a say in the game he wanted to win most." Uh, I don't think so, Kevin. How refreshing to find a star athlete give credit to God--especially when losing. Colt, you MORE than had your say last night. Well done, brother.